As keen as I am on library e-books, I’m as much a booster of the buyable variety. I want people to be able to own e-books for real, ideally without DRM. More and more of our books, music, and even personal files, however, are in The Cloud beyond our direct control. Not on our desktops, smartphones or tablets, but on remote severs, maybe thousands of miles from us, perhaps even continents and oceans away. What’s more, this issue has library angles as well. 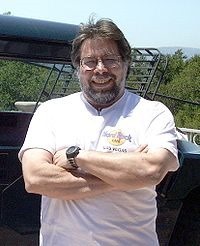 Steve Wozniak, Apple cofounder, shown here, has warned about the pitfalls of cloud computing in general, and a security breach of Apple’s iCloud only reinforced his point. 1. I myself love the idea of cloud computing despite its downsides, but readers should retain the right to buy books they can store on their own computers, even if, alas, this means the use of DRM. Mind you, traditional DRM comes with its own risks if future access to the books or at least downloading is reliant on remote servers. What if the vendors fail? But the good news is that in such cases, traditional DRM can be generally be cracked. This might not be so true of future cloud-based systems. If nothing else, what if a cloud-based vendor goes out of business and the merchandise vanishes? 2. In a library context, people should be able to read books with third-party dedicated software—everything from Mantano to Bluefire Reader—so they aren’t limited to user options in browser-based systems or those offered by library vendors like OverDrive or 3M. I’m talking about specific font choices and other typographical options, for example. Ideally the cloud systems will work not just with vendor-provided software and standard browsers, but also third-party applications that the usual Chrome, Internet Explore or Firefox might not offer. –Without open APIs, cloud-related vendor lock-ins might be worse than with interoperable DRM. Third-party reading systems might not be as easy to develop. –Internet Service Providers and others might be able to more easily snoop on your reading activity than with traditional DRM-based reading systems. Yes, the latter can allow Amazon and the like to spy on you. But potentially the cloud-based approach could expand the number of eyes. –There are potential privacy issues from hackers’ “social engineering” of cloud systems, and in other respects—as the Apple iCloud embarrassment makes clear in a different context. Cyberwar threats only add to the potential ugliness. What if the idea is not just to inconvenience, injure or kill Americans (or others) but wipe out their culture(s)? –Another danger is that with a cloud-only approach the feds could not only spy on your reading habits but also—mind you this is still sci-fi, thankfully—revoke access to your books because your politics were too bothersome. Amazon itself, as I recall, at least temporarily banned at least one customer from continued access to its Kindle books because of alleged violations of its terms of service. Mind you, I’m all for cloud computing, as noted, and, in fact, I favor a robust cloud infrastracture for the Digital Public Library of America or an equivalent. It should allow for reliably networked books that could access text, images and other goodies stored in countless locations on DPLA-controlled servers. But cloud computing mustn’t be the only show for either the retail or the library world (just as the DPLA-controlled infrastructure should be bypassable through the Internet or otherwise, so no one, especially Washington, can dictate to the entire country)! What’s more, given all the risks, expenses and complexities of the cloud-based approach—and to think we now have the growing cyberwar threat, too!—I believe that interested publishers and others should be able to piggyback on a national digital library infrastructure. This should be a no-brainer even if some powerful library, publishing, and retail interests are slow to catch on. The safety and stability of a well-secured library infrastructure, without the risk of material vanishing just because a vendor goes out of business, could help endlessly in the age of networked books drawing on components from many sources by way of The Cloud. I certainly wouldn’t consider buying a cloud-only device. There are too many places I travel to where the cloud just isn’t available.